Let’s start 2015 with a reveal of our library! Yes, that’s right, our once-scruffy “spare room” has acquired a new name and identity. Remember where we started? We’re so pleased with how it all turned out. This room really feels good, and even though we’ve been pretty much done for months, sometimes I still walk in just to admire it. 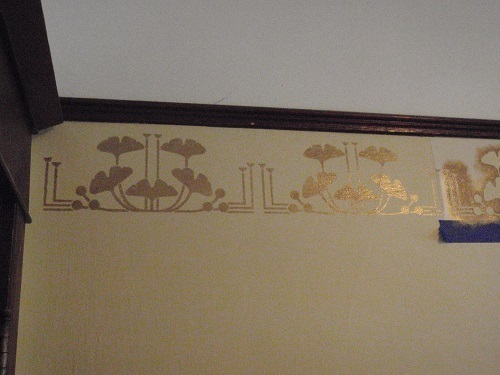 I have many “favorite” things in this room, but my favorite-favorite element is the bronze ginkgo leaf stencil. Sometimes things turn out exactly as I visualized, and this is one of them. It makes the room. C’mon, I’ll show you around. 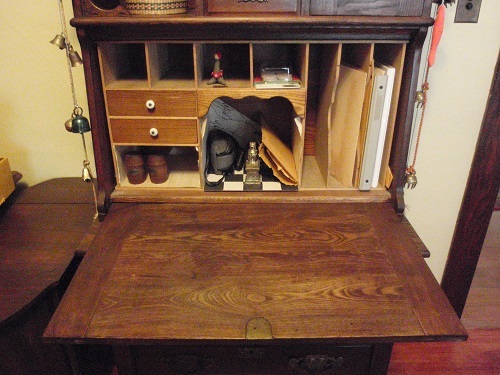 Next to the door from the dining room is my old secretary, an heirloom from my dad’s family, which he refinished as a gift for my twelfth birthday. One of these days I’ll reorganize the interior’s cubbies. 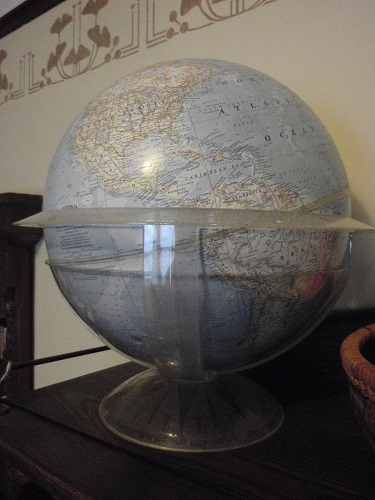 Atop the secretary is a 1961 National Geographic globe. When I designed this room in my mind, I forgot to account for my sewing machine. 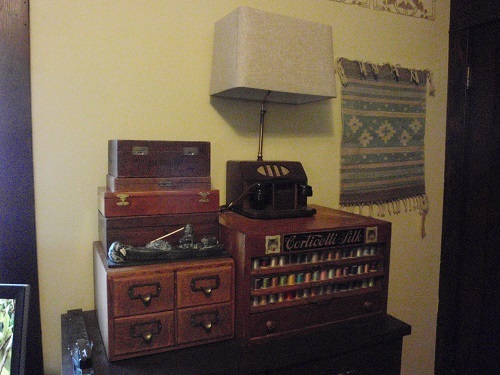 I seldom sew anymore (when I was younger I made almost all my clothes), but when you need a sewing machine, you don’t want to hassle with getting it out of storage and setting it up. 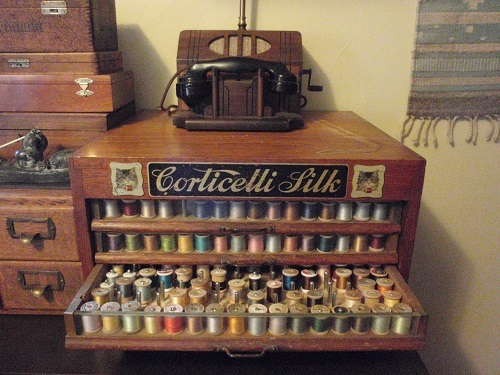 Besides, the antique Singer cabinet (not rare) is too nice to stash away. 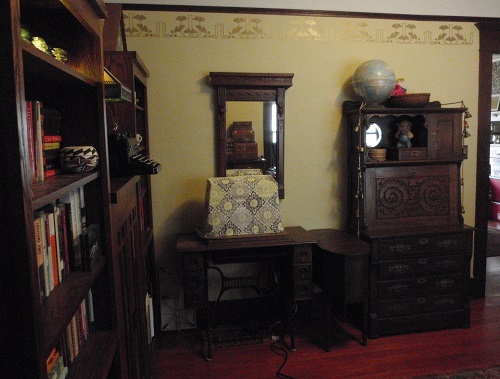 The addition of the sewing machine and the sewing cabinet wedged next to it makes the room more crowded than I’d like. I wanted to buy one of those sproingy leather Poang chairs from IKEA (sooo comfortable) and make a reading corner here … but oh, well. 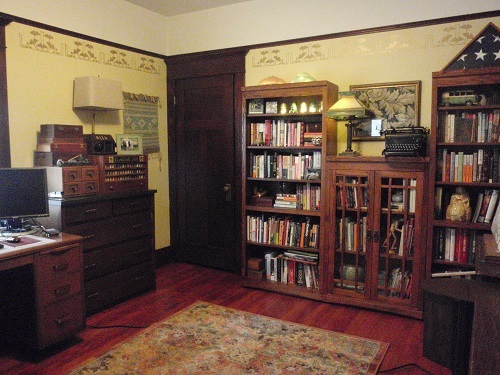 You’ve already seen the bookcases and Mom’s 1935 typewriter, but I’ve added some details. 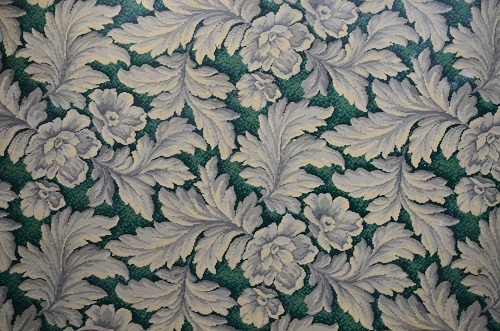 The green acanthus felt-base flooring makes better art than floor covering at this point. Had to save a scrap for posterity! 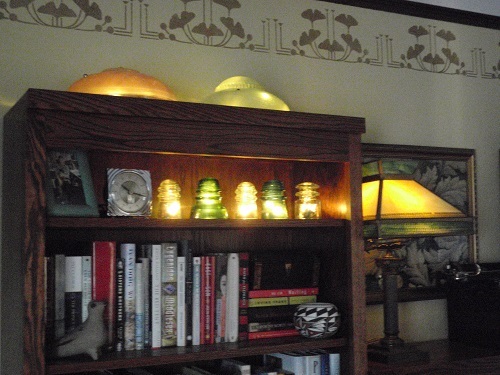 The green and yellow slag glass lamp is one of my earliest memories from my great-grandmother’s lake house in Delafield, Wisconsin (she sold the place when I was three). I used it as a lamp on my desk as a little kid (can you believe my folks trusted me with it? ), and it survived unscathed until two years ago. When Eric and I were on vacation, we got a call from our housesitter that the cats had caused an accident and smashed not one, but two antique lamps. (Our cats tend to have Risky Business-type parties when we go away.) Eric had the glass replaced for my birthday, and now I can’t tell what’s new and what’s original. The lamp is just posing for this photo. We will clip it to the bookcase to prevent another disaster, because neither it nor the cats will survive another fall—physically or financially. Battery-operated LED lights under the original glass bedroom ceiling fixtures create a nice glow on top the tall bookcase. Same with the glass electric insulators on the next shelf. This library has ambiance! The window wall is also crowded with furniture. We simply have too much for this little house, I admit. I would rather have another bookcase here, but this room is where Eric stores his clothes because I have hogged all our bedroom space. What’s that, you ask? It’s an antique wooden executive desk telephone. Why yes, it’s been made into a lamp—isn’t that normal? Apparently there was a time in my family when if something stood still long enough, it got made into a lamp. I intend to take the lamp works out of it. Once I get inside, I hope to learn more about the telephone. I have not found anything like it online. It’s sitting on a Corticelli Silk thread retail display box, which was a gift from a friend long before I became a crazy cat lady. Eric and I both have collections of old wooden boxes, some stacked at left (including—what else?—a library card catalog). My parents brought the soapstone carving of a walrus hunter back from Alaska. Not my favorite scene, but interesting nonetheless. The rest of the window wall is devoted to Eric’s desk and computer equipment. One day when Eric and I were rummaging around in one of his storage units, I spied this awesome Moderne desk. WHAT was it doing languishing in storage instead of in our house?? So it came home with us to live in the library. It’s a Leopold from about 1935 (same year as my typewriter!) and it belonged to his grandfather. I’m so happy we rescued it. On the wall above the printer is our 2014 art splurge: a linoleum block print, Colvos Passage—Late Summer, by renown Northwest artist Yoshiko Yamamoto. 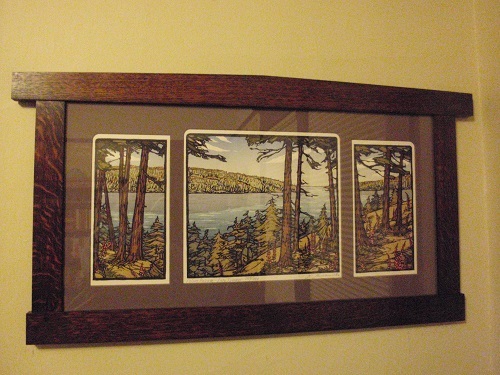 We fell in love with this triptych years ago, but it was out of print for some time. When we saw it again at the Bellevue Arts Festival last summer, we pounced on it. No regrets. Other improvements include Levelor cellular shades that operate from the top or bottom. They’re a close match to the wall color and really help with temperature regulation, not to mention blocking the view of the neighbor’s back door. And we changed out the woefully inadequate single-bulb ceiling fixture (its green shade is on the bookcase). Now we have plenty of light. I wanted something with a vintage vibe but a modern edge. Are we really done? Oh heck, of course not! We still need our electrician to rewire the room (we are still running on an extension cord from the single outlet). Because of that, we haven’t tackled the closet, which is unfortunate for Eric. But the room itself is DONE. So, what do you think of our bungalow library? Want to ask Marian the librarian for a library card and come hang out? 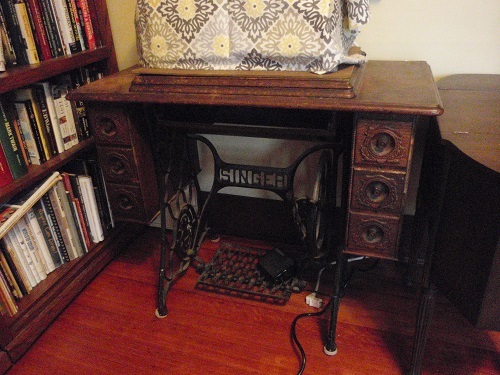 This entry was posted in Library and tagged antique secretary desk, Craftsman bungalow DIY, home library, Leopold desk, Singer sewing machine cabinet, slag glass lamp, vintage typewriter, Yoshiko Yamamoto on January 5, 2015 by D'Arcy H.
Can a right-brained DIYer actually have fun with decimals? Let’s find out! After weeks of toiling in the spare room, it’s finally almost done. I still need to buy a new ceiling light fixture. 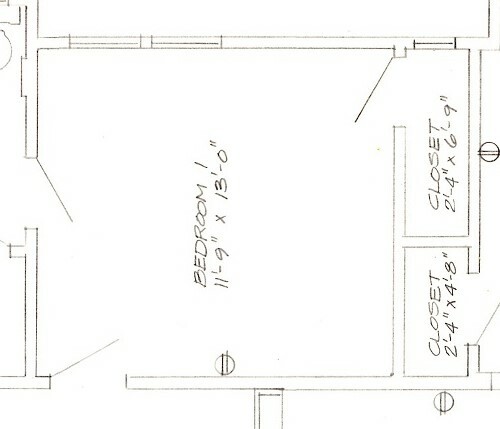 Our electrician, if he ever calls back, needs to rewire the room … then we’ll finish the closet. 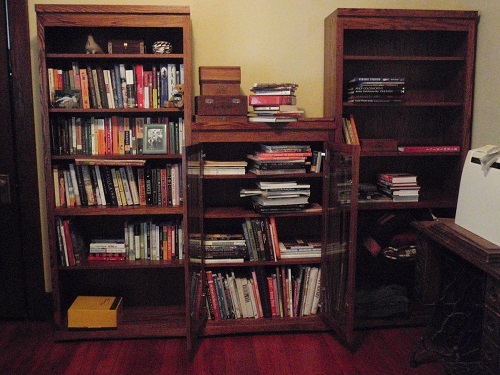 But right now, I want to show you our new bookcases. Before we could put them in place, we had to dismantle the guest bed, which our house-sitting friend used while we were on vacation. The cats were disappointed to see their quiet nap space go away. To create our library wall, we purchased two bookcases: one to match the six-footer that we already have (one for me, one for Eric), and a shorter one in the same style, but with glass doors, which is identical to one in our living room. I was excited to move all of my books out of the dining room storage boxes and into the bookcases … but by the time I finished I was bummed that I’d only eliminated three boxes from the pile of stored stuff. Oh, well … reorganization happens one box at a time (I tell myself). There used to be three more boxes in the front row of this mess. 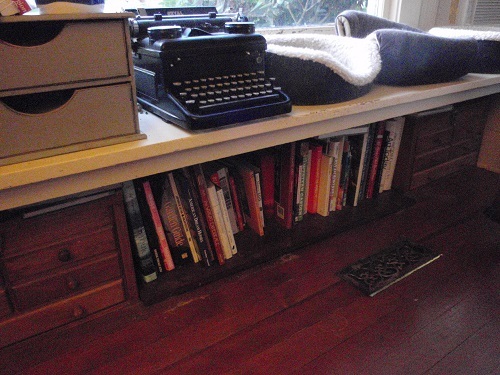 I also wanted to move this row of books that I had cleverly parked under the dining room window seat years ago, before so many cats lived here. Since then, these books have been clambered upon, hidden behind, and made to suffer many other feline-induced indignities. Plus, I have a stash of animal stories in the living room’s leaded glass cases. Oh—and all my landscape design books are in the living room’s glass-doored bookcase. Pretty scattered. 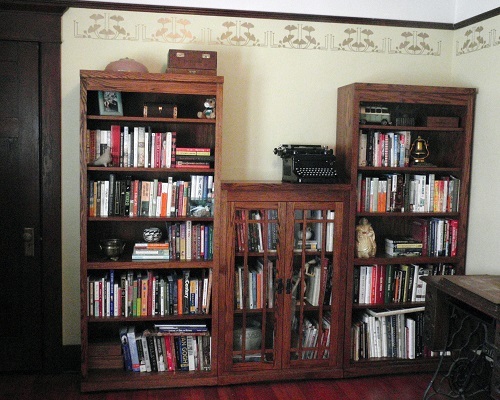 I hauled everything into the spare room—all of my books in one place, at last! Well, not quite. I have several more boxes in the attic, which I’m sure could fill another tall unit … not to mention books I inherited from my parents. I don’t even want to think about Eric’s extended collection, the extent of which makes me cry, which fills dozens of boxes in a storage unit. 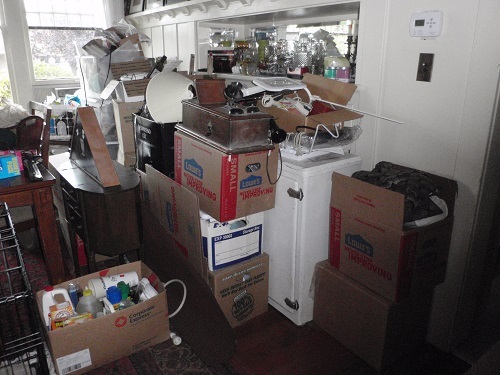 It’s true … writers are loath to get rid of books! I suppose simply getting the books on the shelves would be enough for some folks, but I demand organization. This is a quirk of my personality that I can’t explain. 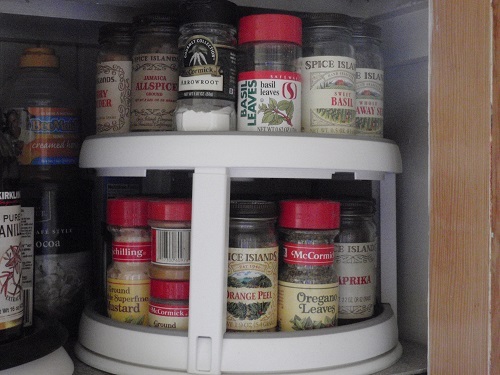 Why can I live with the household clutter of two pack-ratty people, pet-hair dust bunnies, and remodeling chaos, yet I alphabetize my spices and need a system for shelving books? I’ll let you ponder that. Why reinvent the wheel? Why not use the Dewey Decimal system? You remember that, right? No? For as much time as I spent in libraries as a kid, all I could recall was that fiction is filed alphabetically by author’s last name, and biographies are in the 920s. Here are the nonfiction classifications. Does this ring a bell? Armed with some categories jotted down on an envelope, I set to work putting nonfiction titles in order. It wasn’t as easy as I’d thought. Where would you file Field Guide to Elvis Shrines? Soon I had to call in my computer. I discovered that I could look up most books by searching on “‘title’ dewey decimal classification,” and find the first three digits of their classification number. Elvis shrines, you’ll be happy to learn, belong in 782, vocal music. Speaking of shrines, I decided to enshrine my beloved art (730–770) and architecture (720) books in the glass-front cabinet. Until I amassed them, I had no idea I had so many! They wouldn’t all fit. So, I moved all of my gardening and landscape design books (710) back to the living room bookcase. Ditto my books about animals (636 – animal husbandry? Really?) I wasn’t fussy about how I ordered the architecture books. 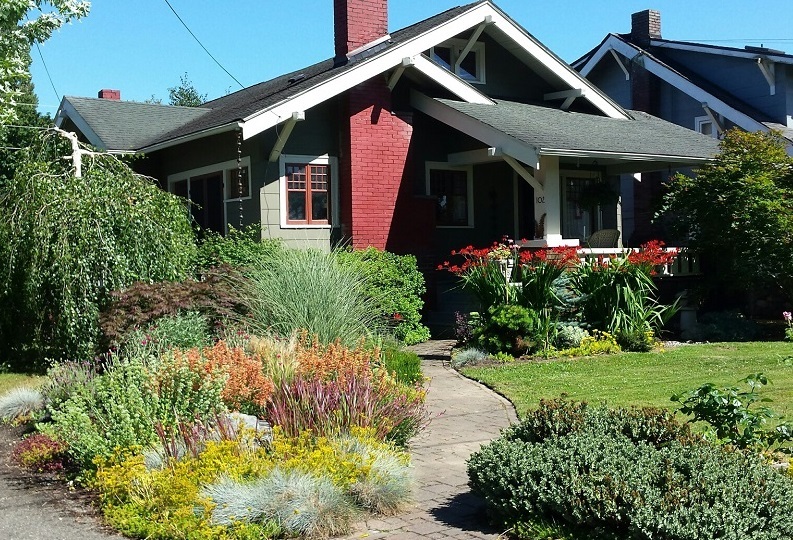 I simply grouped them by affinity: Craftsman bungalow, Midcentury Modern, etc. Okay, I was fussy. Here it is—our library wall—DONE! (except for the books in the attic … and in storage.) 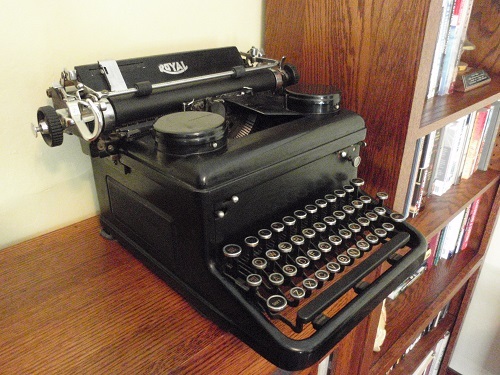 It’s crowned with my mom’s monstrous 1936 Royal typewriter. So … can a right-brained DIYer have fun with decimals? I have no idea. I used only the digits to the left of the decimal point. Hey, close enough! 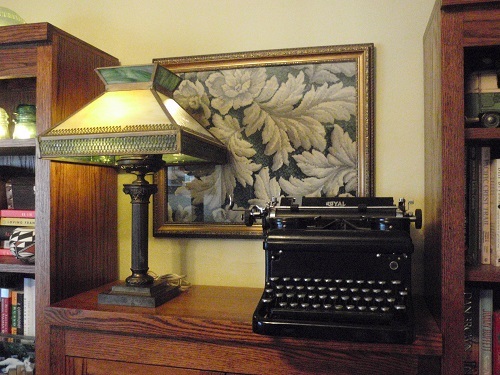 This entry was posted in Library and tagged 1936 Royal typewriter, bookcases, books, Craftsman bungalow DIY, Dewey Decimal system on August 2, 2014 by D'Arcy H.
As you’ve seen at the bottom of my posts, we’ve adopted the ginkgo leaf as our house’s symbol. 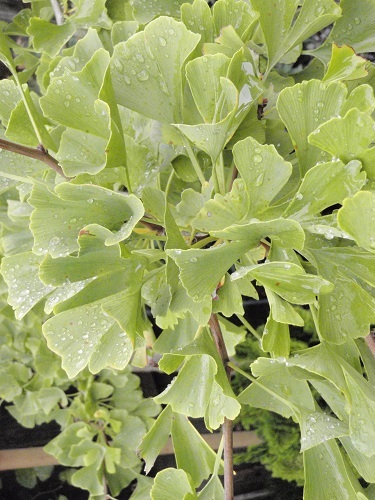 I think it began when we planted a baby ginkgo tree in our Japanese garden five years ago. The little bugger was a stick only three feet tall 2009. Now, it’s over 12 feet tall. 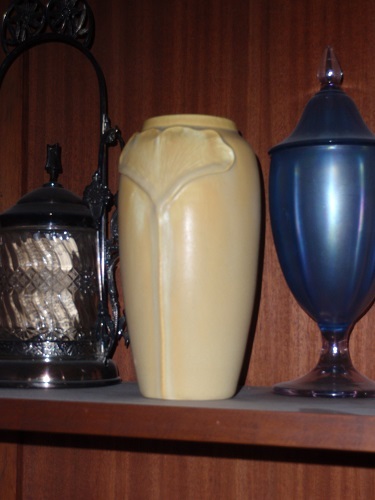 Since then, we’ve accumulated a number of ginkgo-themed items, like this vase from Frank Lloyd Wright’s Taliesin. 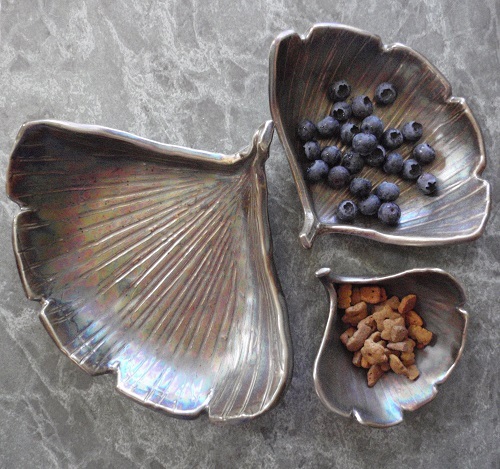 And these candy dishes, souvenirs from a visit to Bend, Oregon. 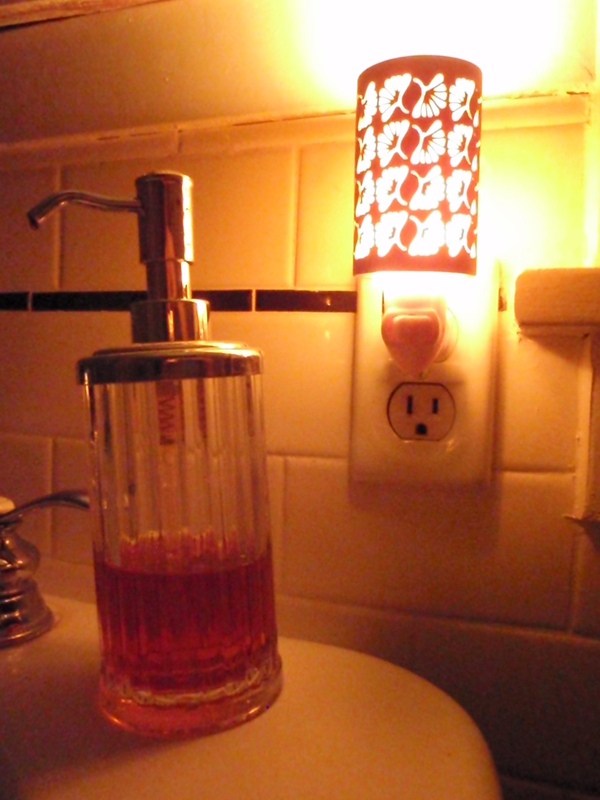 And our bathroom night light. I even have a ginkgo print shirt and two pairs of ginkgo leaf earrings. 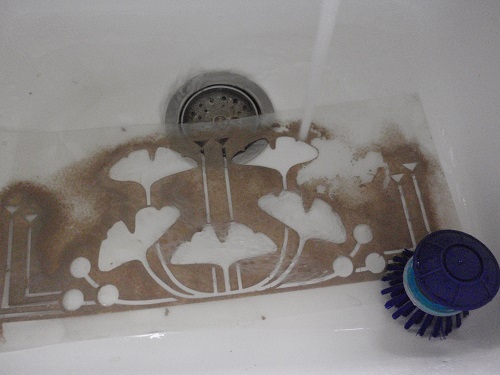 So, we were excited to find an Arts and Crafts ginkgo stencil pattern in the gift shop when we visited Frank Lloyd Wright’s Oak Park home and studio in 2012. Now that we were making over our spare room, I had the perfect place to use it. The honey-gold walls needed a little sumpin-sumpin. In my mind I saw a crown of bronze metallic ginkgo leaves circling the room. Sometimes it’s difficult to translate my visions into materials that are available in real life. 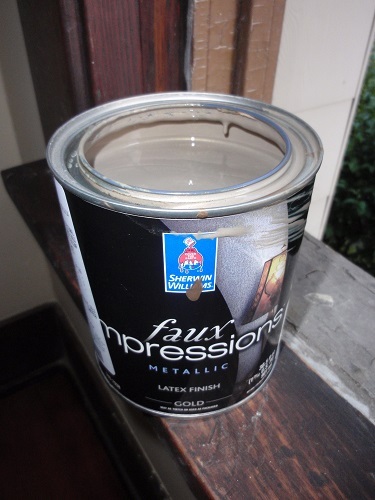 But this time, Lowe’s had the perfect shade of metallic bronze in their paint samples. The paint gal shuffled off to mix a quart. When we returned five minutes later, she informed us that they no longer carry that paint. “Then why do you have the samples in your display?” I asked. “The vendor hasn’t removed them,” she shrugged. ARGGHH!!! With my vision in jeopardy, I turned to the internet. Who makes metallic paint? Sherwin Williams to the rescue! They have metallic paint in all colors of the rainbow. I selected a bronzy shade called “Coconut Husk,” a gold metallic base with a brownish tint. I had never stenciled before, but it seemed like a pretty straightforward process. I was only using one color … what could go wrong? After our floor refinishing fiasco, I’m happy to report: Nothing! 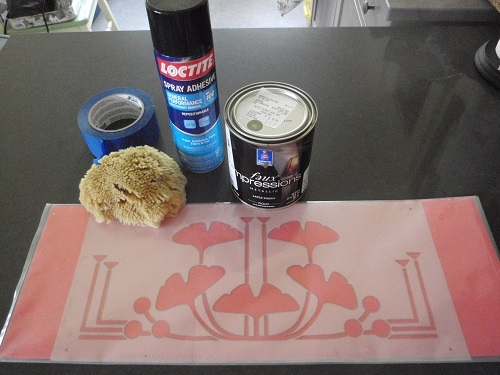 Here’s what I used: the stencil, paint, a natural sponge, blue painter’s tape, and light duty spray adhesive. Plus, a pencil, a paint tray, and a step ladder. 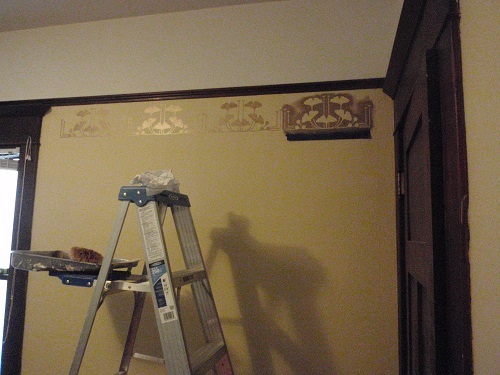 First, I measured each section of wall, found the center point, and determined how many stencil repeats would fit. Then, working from the center point toward each end of the run, I held the stencil against the wall and made tiny pencil marks in its registration holes. Next, I took it outside and sprayed the back with a light coat of spray adhesive, and added a strip of blue tape to the bottom edge. The stencil was easy to align vertically because I simply abutted its top edge to the picture rail, using the tape to hold it in place. I carefully pressed the entire stencil onto the wall, making sure all the delicate pointy ends were firmly adhered. Then I dipped a corner of the sponge in the paint—not too much—and daub, daub, daubed until the exposed wall was uniformly covered. When I was stenciling near the windows, I saw our three feral kitten friends tiptoeing by under the hedge. I rushed to meet them on the front porch to take their pictures. Here are the Morse triplets: Dot, Dash, and Ditto, now nearly a year old. They’re still basically wild, but they interact with us a lot, hanging out with us when we work in the gardens, and showing up every evening for happy hour treats on the back porch. Lately I have been able to pet Ditto while she eats Fancy Feast from my hand, and Dot and I play a game where I walk my fingers toward her and she gently bops my hand. What little sweethearts! Removing the stencil was easy—I simply pulled gently from one corner. I painted three or four repeats, and then washed the stencil in the kitchen sink to remove built-up paint. Respray, retape, move the ladder, repeat. It took a lot of daubing over a couple of days, but at last I was done and I could step back and survey my work. I couldn’t have been more pleased. The effect was exactly as I’d imagined: The ginkgo garland took the room right back to 1913! We love how the light picks up the subtle sheen of the stenciling, and how the border softens the transition from the picture railing to the wall. Now, all we have left to do are install the new window coverings (on order), buy more bookcases and a new ceiling fixture, have the room rewired, and finish the closet. Hmm … we’re not as done as I thought we’d be! Will we ever finish anything?? This entry was posted in Library and tagged Craftsman bungalow DIY, feral kittens, metallic paint, Sherwin Williams paint, stenciling on June 28, 2014 by D'Arcy H.
After all that seemingly endless sanding (during which Eric listened to six Beatles albums on his iPod), the weekend finally arrived when we would stain and polyurethane the spare room floor. 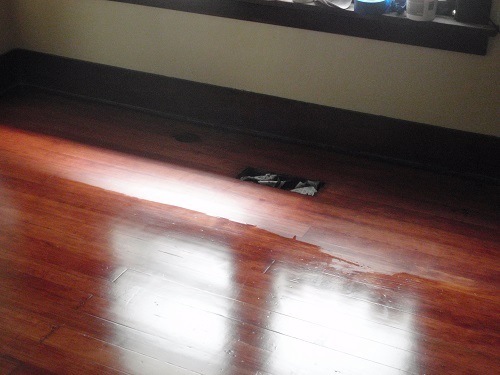 We auditioned two shades of Minwax stain: One matched the room’s fir woodwork, but we didn’t want the floor to be that dark because one of our main objectives is to lighten up the room. 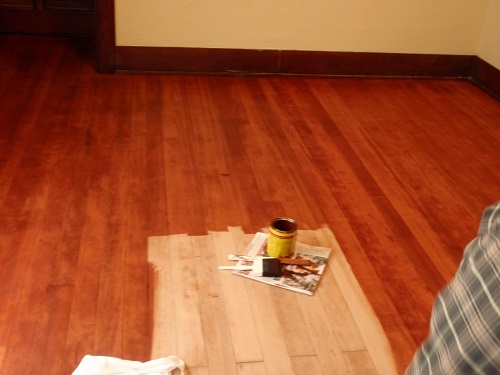 The other shade, Gunstock, had a reddish tone that was similar to the living room floor, so Gunstock it was. Unfortunately, neither of us thought to take a picture when we tested the colors in the closet. We were focused and excited about getting color on the floor. 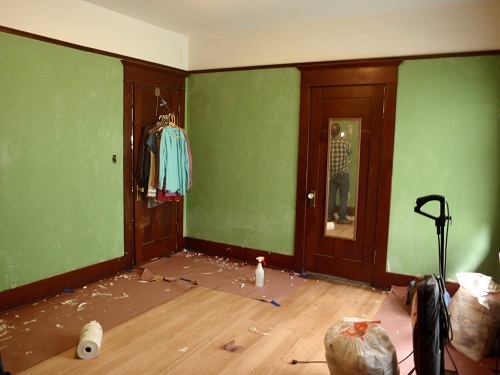 Eric began in the closet, and I on the other side of the room, painting the stain on with foam brushes. 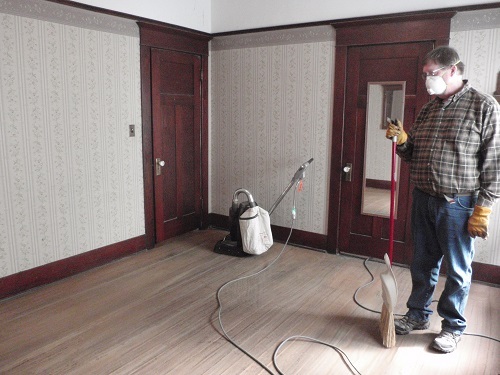 We worked in areas about three feet square, wiping the stain off with rags almost as soon as we applied it because the porous, naked fir soaked up color immediately. After I’d stained my first couple of squares, I lamented to Eric, “I don’t think I like this color.” It seemed awfully red … but we were committed, and there would be no more sanding in this room! We would only go forward! We moved so fast, it took hardly any time at all to cover the entire floor. Then we let it dry overnight. I kept peeking into the room, fretting about the red color. That night, I tossed and turned, unable to sleep as I lay there hating the floor, which glowed orange-red in my imagination. The next morning, I got up and immediately opened the spare room’s door to face down the redness. Well. It wasn’t that red. In fact, it was kind of … pretty. Our friend Cathy came by to go to breakfast with us and she said it was beautiful. By afternoon I was actually liking the color. Was this real, or was I just convincing myself to accept what I knew I could not change? I didn’t have time to ponder it too deeply because I was excited to apply our first coat of polyurethane. I carefully mopped it on with a Shureline pad on a pole. I had my back to the windows, so lack of reflection on the wood made it difficult to see what I had coated. The can said it would dry in three to four hours (“super fast-drying!”), but we had picked the wettest Seattle day we could find. Six hours later, it wasn’t even thinking about drying. We went to bed assuming that it would be dry by morning, but, because more than 12 hours elapsed between coats (“no sanding between coats!”), we’d have to … yes, dammit, sand it before applying more (“complete project in one day!”). But timing wasn’t the only reason it needed sanding. 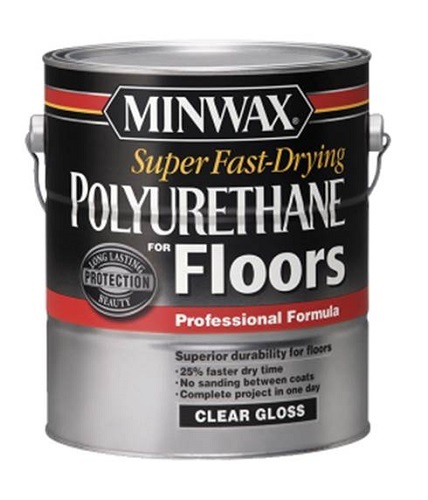 Once the poly was finally dry, I was horrified at what a lousy job I did applying it. The coat was uneven, with blank spots here and visible drips there. You can see the crappy coverage in this photo. It looked worse in person. I was NOT HAPPY. Because it was a work day and golf league night, Eric worked late into the evening sanding the entire floor with a mouse sander. We went to bed that night thinking not about the stain color, but about the next day’s task of cleaning away all that sanding dust. 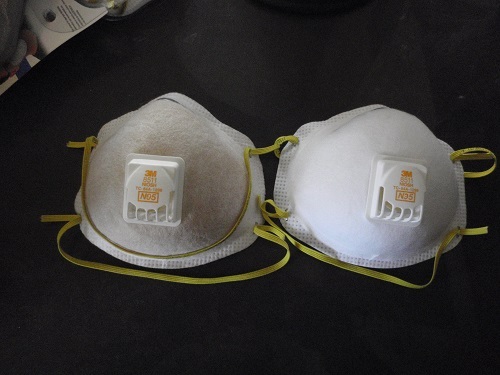 I was hell-bent on tackling the dust situation as soon as I got home from work the following day. So hell-bent that I forgot to take a photo of the dustbowl. I attacked the floor with a vacuum and then a wet sponge mop. When it dried, all I saw was dried puddles of murky residue. This dust was thick and stubborn. When the second mopping made little difference, I adjourned to the living room to pout while Eric tried his hand at cleaning. After four moppings, the floor was finally clean and ready to be recoated. I had developed polyurethanephobia, so I let Eric do the application this time. I can paint the heck out of a wall, but a floor? Evidently not so much. Eric’s poly coat was far more uniform, and only slightly imperfect. Although we’d blocked off the heat vent, when the furnace turned on, a little flurry of pet hair poufed under the door and is now embedded for posterity in polyurethane. Kind of like our pets’ footprints in wet cement. We couldn’t believe our eyes! We had two identically labeled cans of Minwax oil-based semi-gloss polyurethane … only, one was satin finish and the other was semi-gloss! What did I learn from this process? Two things, mainly: 1. It’s hard to fall asleep when you’re busy hating, and 2. I will never, ever DIY another floor!! 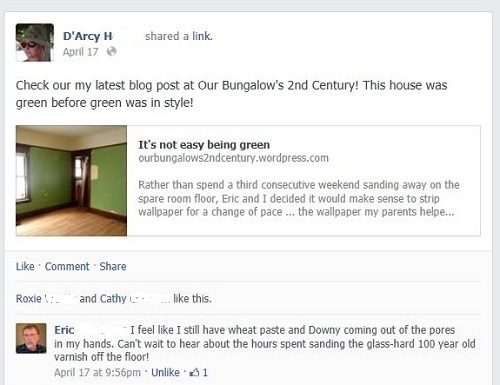 This entry was posted in Library and tagged Craftsman bungalow DIY, Minwax Gunstock stain, Minwax polyurethane, refinishing fir flooring on May 20, 2014 by D'Arcy H.
This is how Eric responded to my last blog post on Facebook. Well … I wasn’t in the room during most of the sanding effort (although I remember well how much fun it was to sand the living and dining room). Every now and then I’d pop my head in to check out his progress and offer helpful suggestions (“Hey, looks great. Want to go get a Starbucks?”) If he wants to read about his hours of sanding, I suggested he write a guest post. I’m still waiting. 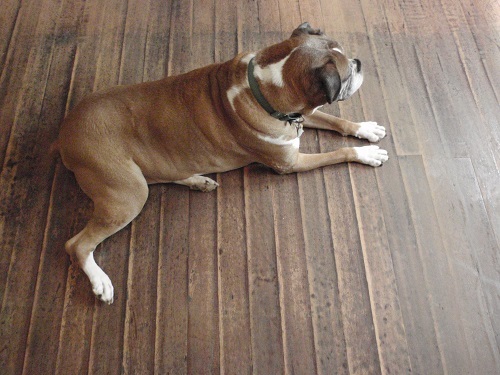 The floor looks terrific … ready for stain. But I’ve been focused on the walls. 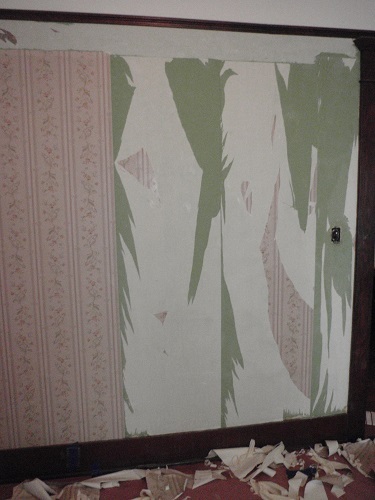 After all the paper was gone, we were left with walls that looked, well … 100 years old. They’d been gouged and patched (poorly) and abused. Add to that, plastering is not a perfect art. Looking closely, I noticed many small trowel marks that all angled from upper right to lower left. (The plasterer was right-handed.) I think it’s kind of cool that the marks of his craft are still visible on my walls, making me wonder, a century later, who this person was. 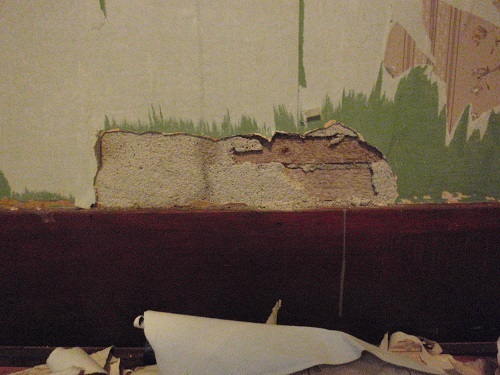 I grabbed my tub of plaster patch and worked my way around the room, skimming over all the areas where the paint had pulled away with the wallpaper, evening out old lumpy patches, sealing cracks, and filling gouges. Yes, I even filled some of the plasterer’s marks, although plenty are left. 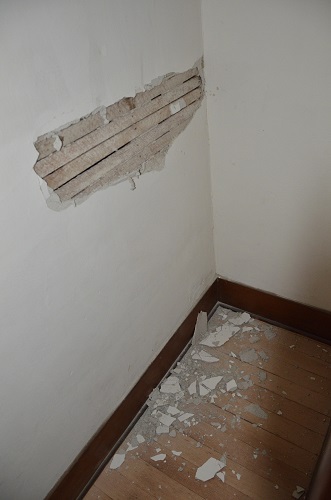 I did a reasonable job of disguising the big crater where I pulled that chunk of plaster off the wall. Quite the work of art, by the time I was done! The next day, after everything was thoroughly dry, I sanded the entire wall surface with the mouse sander. Although this sander has a dust catcher, it did little good with ultrafine plaster dust. The green powder covered everything and swirled in the air like the Oklahoma Dustbowl. Yes, I wore a mask. This is not my bra. It’s a used mask next to a new mask. After all the dust settled (literally), I blew my nose and vacuumed the walls and floor, then I mopped the walls with a damp sponge mop. As an old boss of mine used to say, “It’s not good, but it’s better.” The low spots were higher and the high spots were lower. 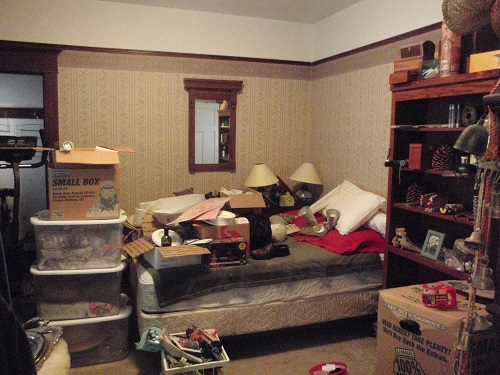 In fact, this room hadn’t been so smooth and clean in decades—maybe ever. Finally, I was ready to paint! It was late in the afternoon, but I still had time to paint one wall for a color preview … only to find that I had no paint rollers. Life can be so cruel! 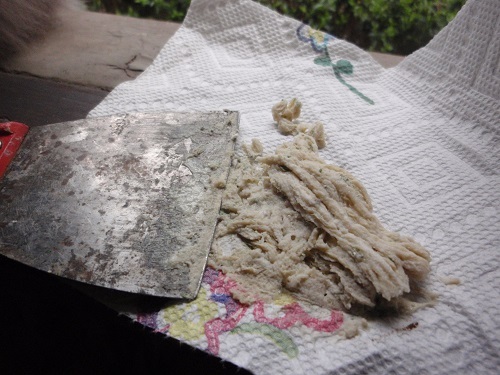 We have recently learned about keys—those globs of plaster that ooze out between the strips of lath. That’s the base coat of plaster pushing through the lath and getting a good grip. 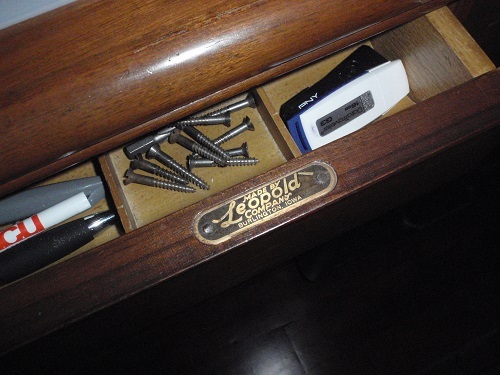 When the plaster fingers, or keys, break off, the plaster is no longer attached to the wall. 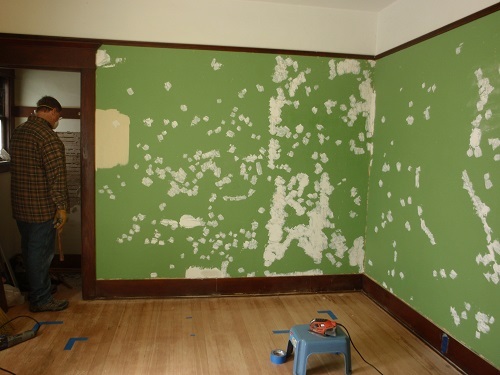 You then have a choice of removing the plaster and replacing it with drywall, or going through a whole bunch of rigmarole trying to glue it and screw it back into place. We’re not into rigmarole. 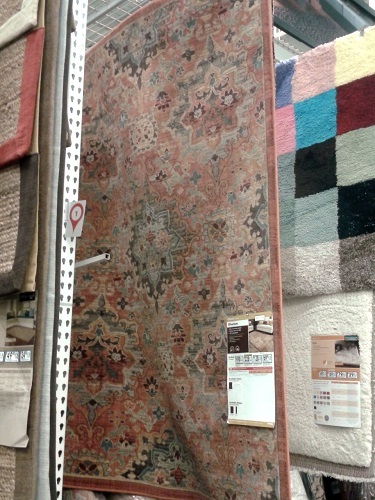 In the meantime, we (well … I) got excited about our chosen rug and could put off the purchase no longer. We started to wonder if we really needed the 8 x 10 size. 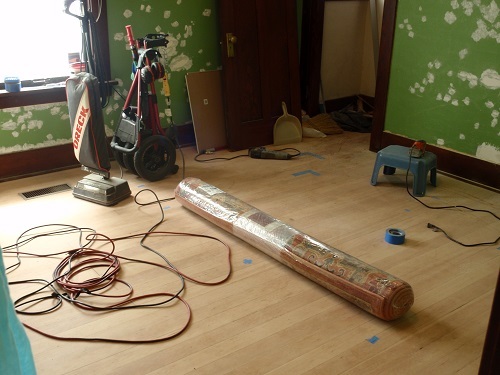 By the time we put the furniture in the room, the floor space effectively will be reduced, and we want some wood to show around the border of the rug. We put tape marks on the floor where the rug will go and discovered that the 5 x 8 version is the one we want … and the one we rushed out to buy, coming home with it sticking out the car’s sunroof. We won’t unroll it until the floor is finished, but it feels good to have another piece of the puzzle at the ready. And I was not sad to pay less for the smaller size. 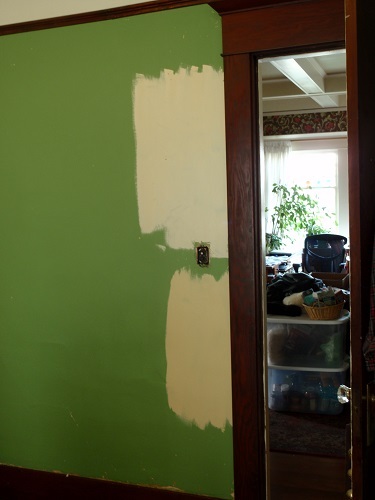 I knew painting a lighter color over pea green would take two coats, regardless of the paint+primer claim. (I always use two coats, anyway.) I liked the sample, but I was concerned the color would come out more yeller than amber. I didn’t want yeller. 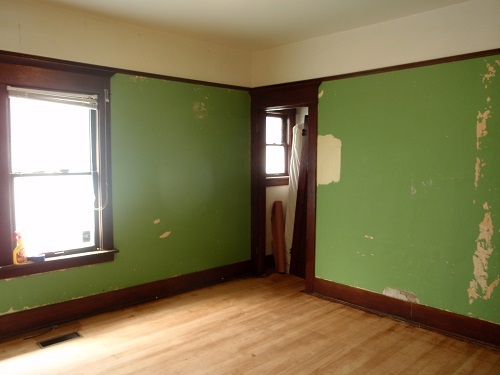 A lot of green showed through that first coat, and we stood back, tilting our heads and reserving judgment. The second coat made all the difference, and soon the room was looking as I’d envisioned. I had to do some of the painting at night with the dim single-bulb overhead light and one work light. 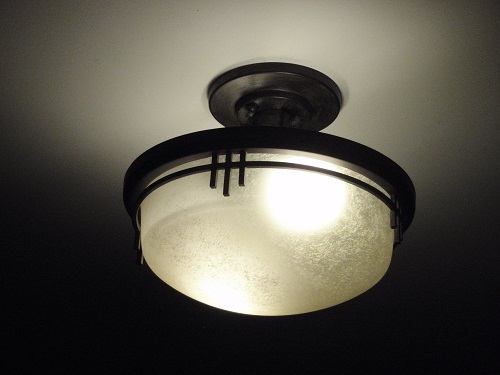 The incandescent lamps turned the color yeller, but it’s easy to buy color-correct LED lighting these days. Which reminds me, I have to pick out a new ceiling fixture. It’s hard to accurately capture the color in photographs. The second one is truer. What do you think? I’m particularly pleased with the color during the day, with natural light pouring in from the windows. I pop in every morning and afternoon to admire its golden glow. 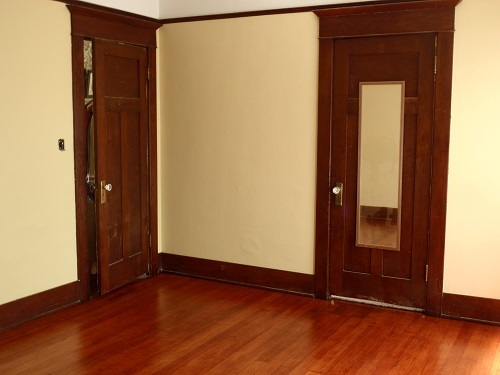 It’s bright, it’s neutral, it compliments the woodwork, and it feels right in our old house. Okay, walls are done—next, we hit the floor! This entry was posted in Library and tagged Craftsman bungalow DIY, painting prep, plaster repair, Valspar paint on May 3, 2014 by D'Arcy H.
Rather than spend a third consecutive weekend sanding away on the spare room floor, Eric and I decided it would make sense to strip wallpaper for a change of pace … the wallpaper my parents helped me hang back in 1984. It was sure to be a messy job and we’d want to finish-sand the floor after we created a mess on it. 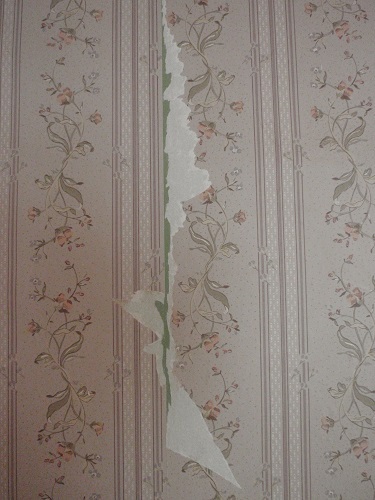 Wallpaper can be removed in a number of ways. Based on a friend’s experience and what we read online, we made a plan: We’d use a perforating tool to pierce its skin with a million tiny cuts, then, while it was still smarting, squirt on a 1:1 mixture of hot water and fabric softener until it lost its 30-year grip and slid to the floor, defeated. I probably don’t have to tell you that it didn’t quite happen that way. Oh sure, the first couple of pieces pulled off quite nicely, as if to tease us, but then things got rough. This paper was not going to go quietly. We pulled away large chunks of the printed surface layer, but the adhesive underlayer still clung to the wall. Sometimes it made me dizzy and I couldn’t tell if we were removing the flowered part or the green part or the white part. If this looks confusing, just remember, we wanted the walls to be green. We squirted more water/fabric softener. The rain fell outside, and the air grew equally damp inside. Our hands were wrinkled, but Downy-soft. Double-soaked, the underlayer came off in maddening little shreds. I used my thumbnail to coax it off. At some point I wised up and switched to a putty knife. This is not a job to do if you want to maintain your manicure. Sometimes I pulled hard and got more than I bargained for. Oops. I’ll have to do some spackling and plaster repair. Then we came to the section where, thirty years ago, my dad had insisted on using traditional brush-on paste because he was skeptical of new-fangled pre-pasted paper. Of course, dampening only one side of the paper made it buckle on the wall … which finally convinced him that following the instructions was a better idea. (I remember soaking the paper in the tub like it was yesterday.) I don’t know if this section of paper was any harder to remove, but it did leave twice as much paste behind. Suddenly I was thinking of Cream of Wheat smothered in milk and raspberry jam. Wallpaper paste is made out of wheat, right? But, we got it done in one day. Or rather, we got the bulk of the paper off in one day. The next step sounded a lot easier: wash the wall with soap and water to remove the remaining paste residue. HA! I developed a system: Swab a section of wall with a wet sponge. Swab it again. Scrub in circles with a stiff-bristled brush until the paste dislodged. Wipe with a wet sponge. Again. Again. And again. I worked on one side of the room, Eric worked on the other. This washing went on for three days. Well—we work during the day … so more like one day and two evenings. But it felt like three whole days. In this photo, the walls are milky-looking with dried paste residue. But at long last, the room was clean … and green! So what’s with the story with the emerald green paint? 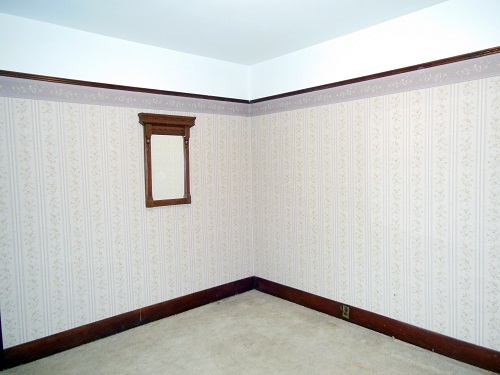 When I bought this house, it was spotlessly clean and recently repainted … but the previous owner made some odd color choices. 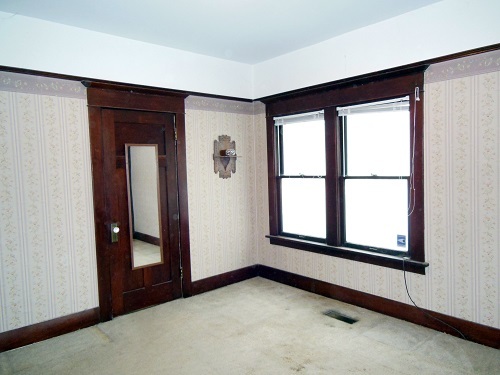 The living room was totally beige: walls, woodwork, and ceiling. With the olive green wool carpet it felt like standing on a bed of spinach, covered with cream of mushroom soup. I repainted it a taupe-y shade that held a hint of mauve at night. Hey, give me a break—it was the 80s, and I was too young to know better! The kitchen was shell pink—an odd shade for a kitchen, but its warm glow grew on me and I kept it for years. 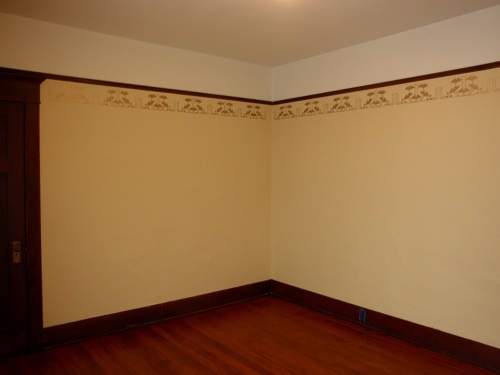 Above wallpapered wainscoting in the bathroom, the walls were a stomach-cramping shade of ochre. 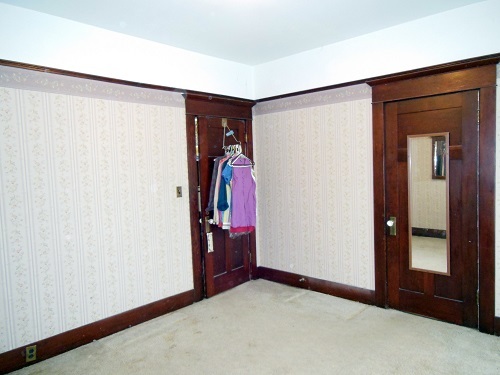 And my bedroom ceiling (above some amazing pink and gray vintage rambling rose wallpaper) was Pepto-Bismol pink. Compared to all that, the green room wasn’t so bad. As soon as the clean walls dried, I slapped on some color samples. The lighter one (top), which Eric had favored, washed out to off-white. “It’s too light,” he admitted. The amber color that I liked (bottom) looks pretty good. I’d like to go a little bolder, but I know that won’t fly. “It’s too dark,” says Eric. It’s hard to capture the true color with my camera. 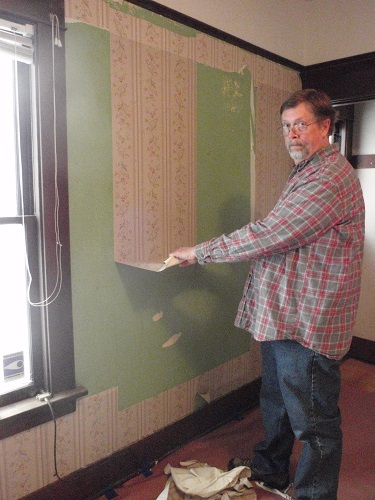 This entry was posted in Library and tagged Craftsman bungalow DIY, stripping wallpaper on April 17, 2014 by D'Arcy H.
The guy in the tool rental department recommended a buff sander (a flat pad) rather than the monster drum sander I’d used on the living and dining room ten years ago. “A drum sander’s too aggressive for fir floors,” he proclaimed. Never mind that I’d used one quite successfully all on my own … what do I know? So we came home with the buff sander. The first thing we noticed was that it was a lot lighter than a drum sander. Eric went to work, and the first pass results were promising. Much of the dark varnish came right off. Hey—piece of cake! 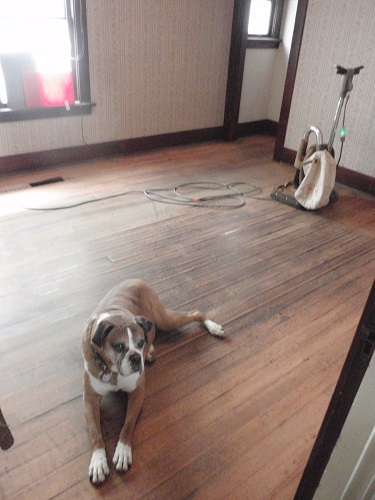 Or, that’s what we thought … until Eric vacuumed the floor and we saw that the “bare wood” was mostly just sanding dust! 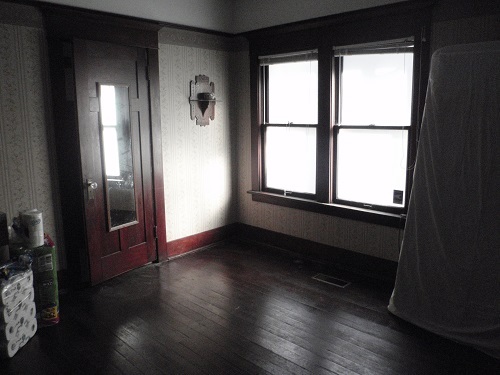 The perimeter of the room lightened up fairly fast, but the middle has a distinct shadow of a long-ago rug. 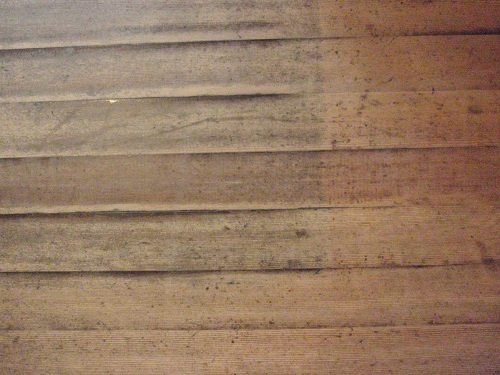 Whatever type of finish is soaked into this old floor, it doesn’t want to give up anytime soon. Checkers and Duke volunteered as smoothness testers. In addition to the stubborn shadow rug, sanding revealed just how uneven the floor is. I had thought it was in good shape−it didn’t feel bad, but sanding hit the high spots and showed that many of the boards are badly cupped. What had happened in here? It took me an entire day to remember that before I had the ceiling Sheetrocked … before the rainstorm that caused a water feature to pour onto the bed … before I had the new roof put on in 2005 … before any of this, there was a cottage cheese ceiling with an old water stain. The attic dormer above this room had evidently caused problems before I bought the house. (As long as I’ve owned the house, it never leaked before my own roofing disaster—a topic for another day). There must have been a flood in here at some point. Want to see something other than pix of floorboards? While Eric was kickin’ up dust, I was doing some filling and sanding in the kitchen, prepping for tiling the backsplashes (more on that soon). My mind was turning over possible finishes for the spare room. Toward my lighter and brighter goal, I envisioned pale, honey-colored walls and a neutral, traditionally patterned area rug. 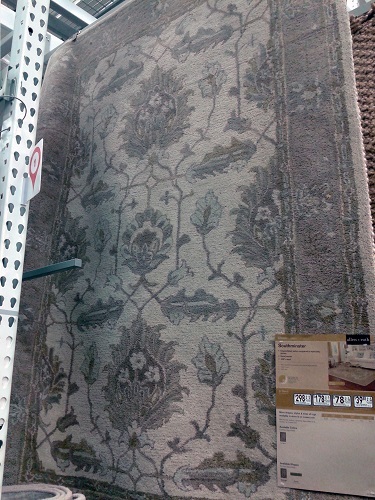 In fact, a rug we’d seen at Lowe’s had caught our eye … well, my eye, anyway, and Eric seemed agreeable. I wanted a second look, so that evening Eric took me on a date to Lowe’s. Is he a lucky guy or what? His wife wants to go to the home improvement store for a date! Here is rug candidate No. 1. (Sounds like the announcer at the Westminster Kennel Club Dog Show.) 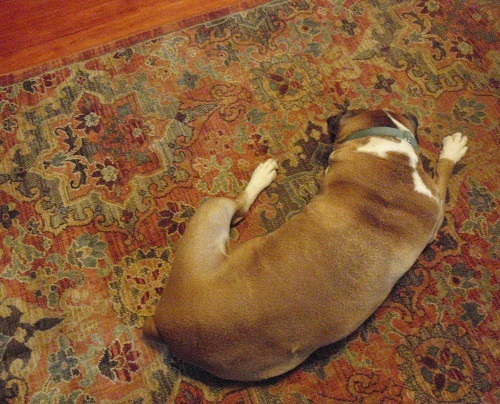 This phone photo washes out the color … the rug isn’t gray, but cream, tan, gold and greenish. An 8 x 10 = $300. 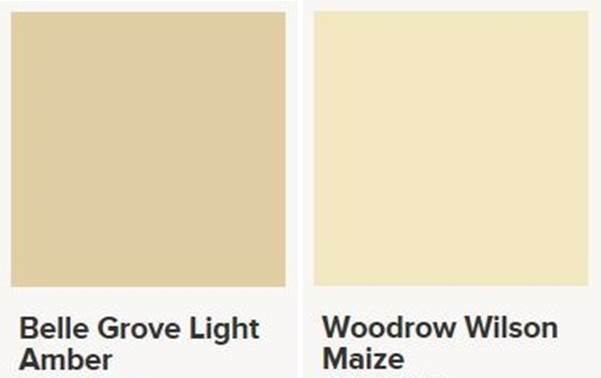 We walked over to the paint department, where my eyes kept landing on one shade: Woodrow Wilson Maize. But when I brought the swatches home, I favored Belle Grove Light Amber. Eric vetoed amber as too dark (which he says about every paint shade I pick). These screen captures aren’t super accurate …but, what do you think? The corny shade will brighten the room in the daylight and create a nice warm glow at night. I think it will be perfect with our future rug and the room’s fir trim. It is, after all, Eric’s room. I have a surprise detail planned for the walls, but I won’t reveal it quite yet. 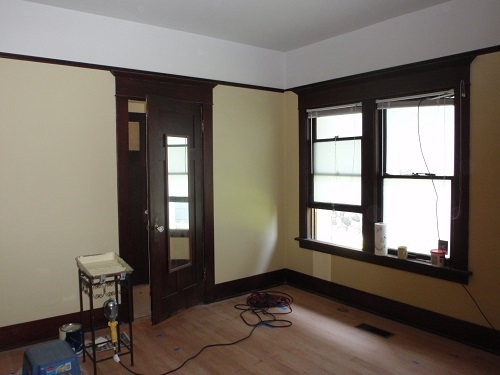 This entry was posted in Library and tagged buff sander, chosing paint color, Craftsman bungalow DIY, refinishing fir floors on March 26, 2014 by D'Arcy H.
While I was still lying around sick and useless (I have fully recovered), Eric got busy in the spare room. Occasionally I would shuffle past the door, and each time I did, the room had a different appearance and quality of light depending on what kind of flooring surface had been exposed. It’s easy to rip carpeting out. 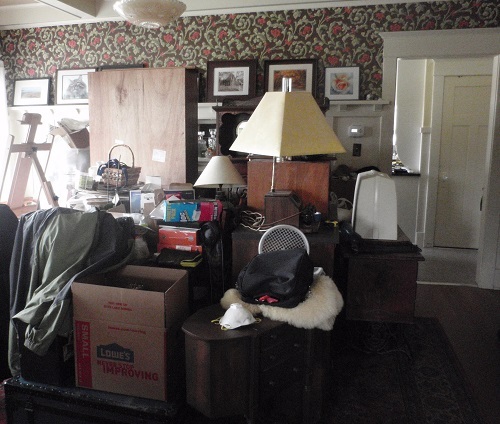 I did the entire living room, dining room, and foyer by myself in 2004. Just slice and roll, and tape it up. Schlep it out to the garage until it goes to the dump. I have to admit, though, it’s even easier when someone else does it. 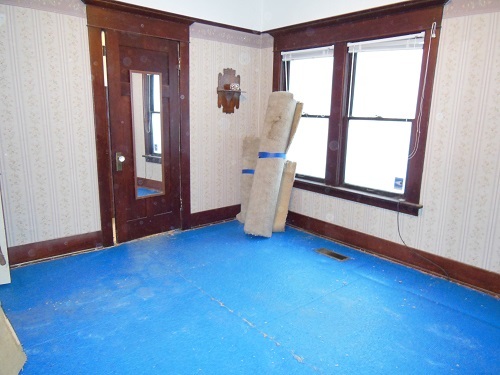 Eric quickly took it down to the blue-backed carpet pad. 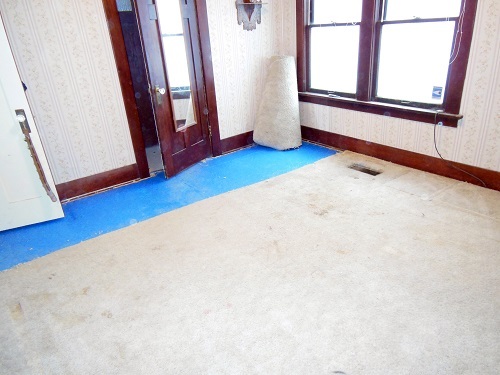 Anyone who has ripped out old carpet knows that it’s a gross job. Carpet holds a tremendous amount of dirt and nastiness, and much of that dirt is actually sloughed-off human skin (and in our house, pet dander). YUCK. So if you’re ripping out carpet, for heaven’s sake, wear a mask!! After pulling a million staples and the tack strips from the perimeter of the room, Eric escorted the pad to the garage. 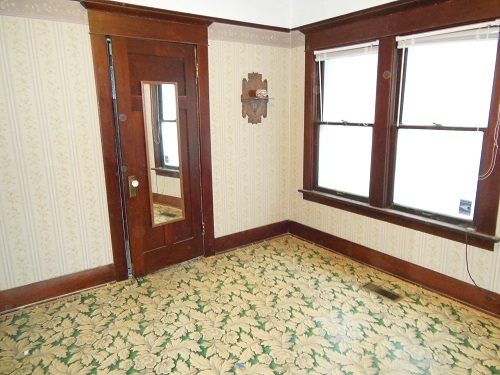 And there it was, just like I remembered it—the green and gray linoleum “rug”! Isn’t it fabulous?? I am such a sucker for acanthus leaves. It takes a certain type of person to appreciate this funky relic … and I am that type of person. Wanna see more? Are you dizzy yet? As much as I loved it, it’s not the look I envision for our new office/library/whatever room. It had to come out … but we were worried that it was stuck to the floor with mastic. If that were the case, scraping it off could ruin the fir floor. Eric peeled back a corner … and just kept peeling. It had never been glued down. How often does that happen? Soon the carpet, pad, and lino rug had been disposed of at the local waste transfer station. I honestly mourned the lino rug, but Eric assured me it was cracked and torn in places, and extremely brittle. But, he saved me a big swatch for my vintage linoleum collection. 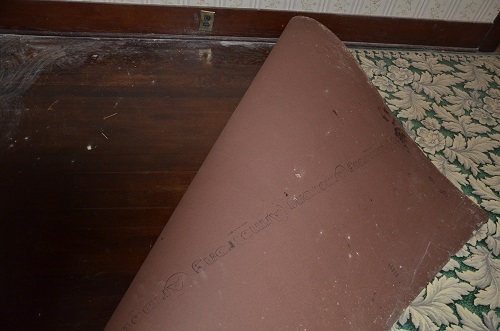 The original fir flooring was finally exposed to the light of day for the first time in maybe 70 years. 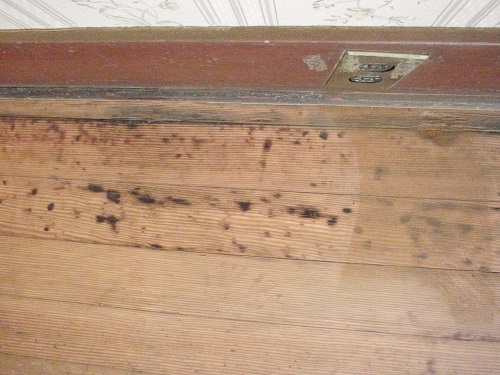 I wish I could create a scratch-and-sniff spot so you could experience the smell of this 100-year-old floor. NOT GOOD. Eric scrubbed it with vinegar and water and we opened the window and closed the doors, but the rank mustiness pervaded the house for a few days. (It’s much better now.) The wood is in great condition, although the finish is worn and scratched in places and quite dark, which makes the room look gloomy. This late-afternoon photo captures old-house gloom perfectly. We’ll refinish the wood in a lighter shade that will match the living room and dining room floor. Linoleum has been around since the mid-1800s, but back in the 1910s, Congoleum invented a cheaper competitor. Instead of linseed oil, this product was made from asphalt-impregnated felt, and was known generically as felt-base. 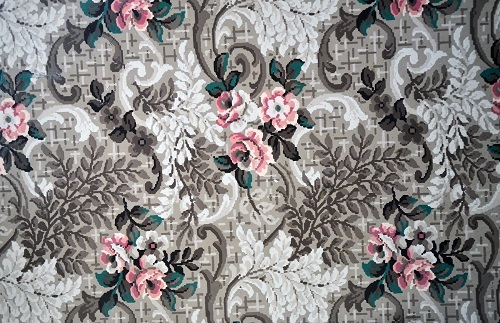 Patterns were printed on the surface and it looked just like linoleum. The back was coated with iron oxide, which accounts for the red color. Armstrong began making their version of felt-base in 1916. 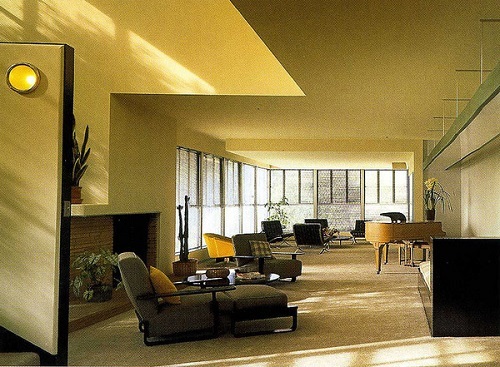 Felt-base rugs were available from Armstrong and other companies into the 1950s. Judging by the pattern, I think this one may have been from the 40s. Powell says, “These are pieces of history and shouldn’t just be tossed into the trash.” … Uh-oh. Did we screw up? Well … damn. 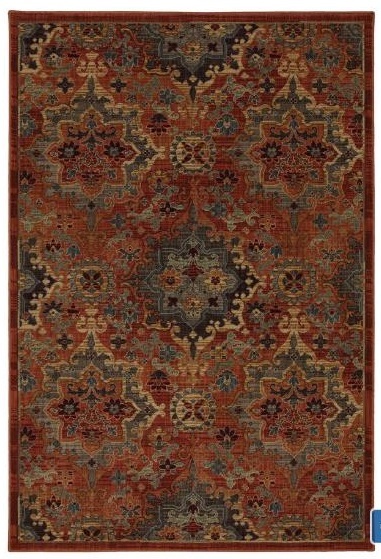 I feel sad that my rug is biodegrading in a landfill, even though I know the room will look better without it. 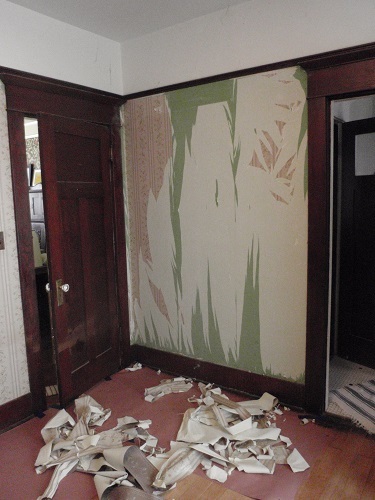 I both regret that we didn’t keep our rare piece of history and look forward to creating a cleaner, brighter space. What can I say … except that the felt-base rug in our bedroom is definitely here to stay!! This entry was posted in Library and tagged Armstrong, Craftsman bungalow DIY, felt base rug, fir flooring, linoleum rug on March 18, 2014 by D'Arcy H.
… And I’m happy about it! No, I’m not talking about our sleeping arrangements. I’m talking about a new project!! With most of his role in the kitchen remodel coming to an end, Eric is itchin’ to clean up our much-neglected and maligned second bedroom, known to us as the “spare room.” Or maybe he started itchin’ just from walking in there. 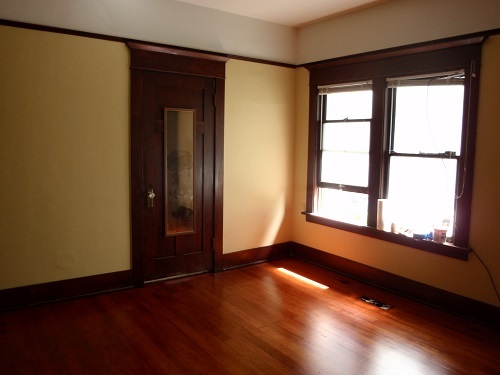 In a house of under 1500 square feet, how can any room be considered “spare”? Don’t you think we could make better use of this space? No kidding. The plan. You gotta have a plan. How do we want to use this room? Eric wants to move his home office in there from the foyer. 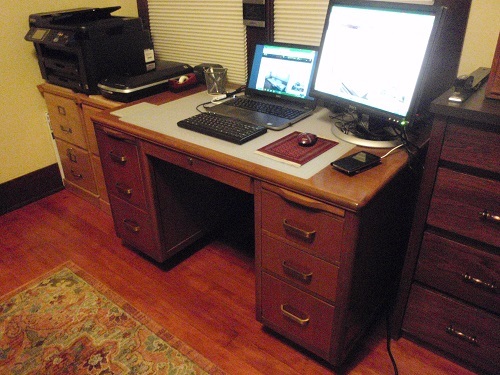 Eric has worked from home for years, and the foyer was an ideal space for his setup. (We never use the front door except to feed the porch cats. We live on a corner, and we’re strictly back-door people.) But, times change, and now he must report to the office every day, and he no longer needs to occupy the foyer with computer paraphernalia. 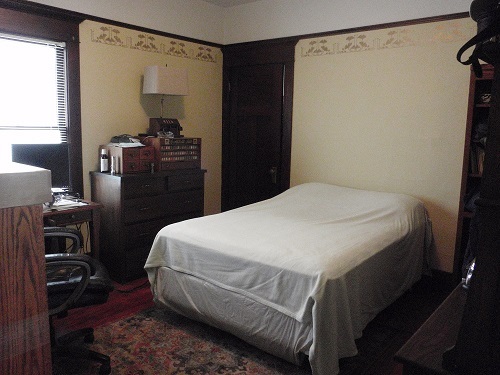 We also want to keep our full size guest bed in there, even though we have not had overnight guests since 2011. We’re thinking of building a Murphy bed. Is this wise? Or should we just stash the frame, mattress, and box spring in the attic until someone decides to pop by? One thing we agree on: bookshelves. Being writers, we’re also rabid readers, and we are loath to toss a book when we’re done. We desperately need more bookshelves. The room could become an office/library. One more thing. Two more things. A big treadmill (used occasionally) and a hurky exercise bike (used … never). I guess you could say our intended use of the room is a little unfocused. I don’t know why this should bother me, except that I’ve heard that criticism from too many HGTV Realtors. Remove the carpet. Refinish the floor. Buy a rug. 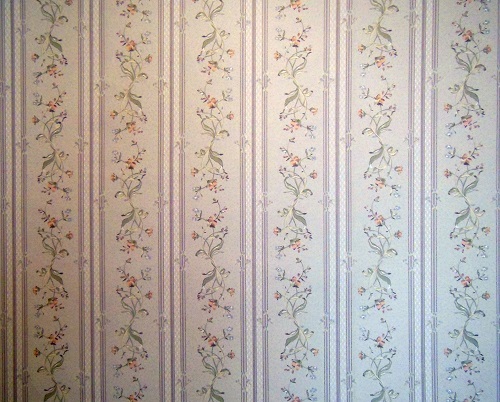 Strip the wallpaper. Paint the walls. (The ceiling was repainted not long ago and looks good). Configure better clothes storage in the closet. This is Eric’s space. Buy new window coverings and light fixture. Install new outlets (there’s only one!). The first order of business was to remove everything from the room, which fell entirely to Eric when I inconveniently got sick. I truly felt bad about that. I mean, I was really, really sick. I begged Eric to shoot me, but we don’t own a gun. I considered crawling two blocks to the commuter rail station to lie on the tracks at rush hour … but I could scarcely crawl my way out of the Barcalounger. You get the picture. I helplessly hacked and moaned while the furniture in bedroom became furniture in the dining room. Ah, that’s better. I know that look. 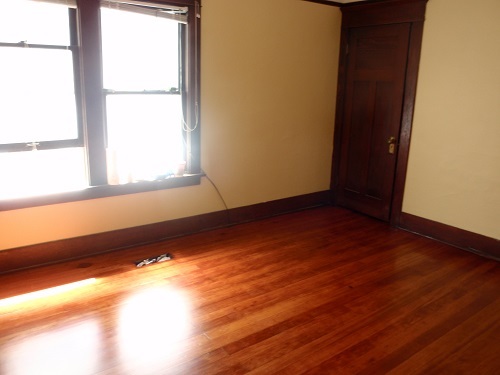 Now that the room is empty, you can see its features: It’s 11′-9″ x 13′-0″. The entrance is off our dining room (on its north wall). On the east wall is a door to the bathroom. This room is meant to be the master bedroom, but I’ve always used the one at the back of the house because it’s quieter … and the two windows on the south wall look directly into the back door of the house next door, hence the frosted film. On the west wall is the closet door. This closet is approximately 500 ft deep, and I’ve never been to the end of it. There may be a portal to 1913 back there. It’s completely inefficient for storing clothes, and it’s Eric’s option to make it work any way he pleases. 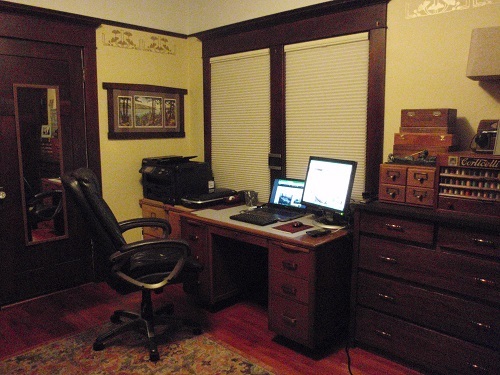 From windows, looking toward northwest corner; closet door out of frame on left. Notice our token outlet in the baseboard. What will we do with the floor? I had the carpet installed in 1987. It’s been through three boxers and 10 cats. Anyone who has pets knows what I’m alluding to, here. Those of you who don’t have animals—use your imagination. 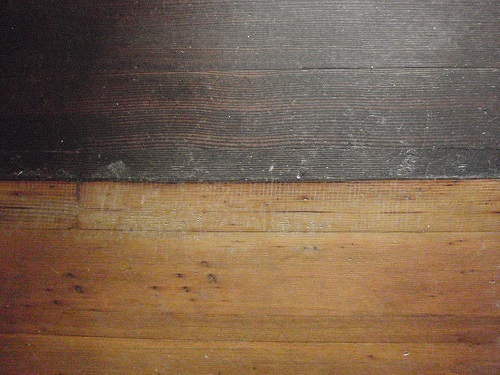 The main living area floors were refinished 10 years ago, and the same fir flooring is in both bedrooms. But, do we want to refinish it ourselves, or have a pro do it (which involves moving out for three days while the finish off-gases … which I do not relish)? Beneath the carpet is an ancient sheet of linoleum in a gray and green “hooked rug” pattern (a different pattern graces our bedroom). I can’t wait to show it to you! I am probably the only person on Earth who sees the vintage charm in this … therefore, it’s gotta go. We don’t know if the lino is glued to the floor or will peel right up. Ha! … nothing ever “peels right up,” … unless you want it to stick. What bothers me about this project is my lack of a clear vision for the result. It was my crystal-clear vision of how I wanted the kitchen to look that guided my decisions and pulled all the details together so well. I’m not there yet with the bedroom. When I mentioned this to Eric, he said, “This is MY room!” WHAAAAT??? Someone else making design decisions?? But—but—but—I’m an only child! I must have things my own way!! I AM THE DECIDER!! This entry was posted in Library and tagged bungalow bedroom, Craftsman bungalow DIY, guest bedroom makeover on March 9, 2014 by D'Arcy H.